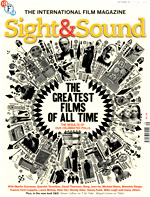 Sight & Sound Magazine, every ten years since 1952, has published the results of their pollings of the world's leading film critics who were each asked to compile a list of the ten greatest films of all time. As a qualification of what 'greatest' meant, Sight & Sound's recent invitation letter stated to the participants in the polling: "We leave that open to your interpretation. You might choose the ten films you feel are most important to film history, or the ten that represent the aesthetic pinnacles of achievement, or indeed the ten films that have had the biggest impact on your own view of cinema." Thus, the compiled critics' lists determined which films stood the test of time in the face of shifting critical opinion. Ultimately, a list of the critics' Top 100 films was determined based upon all of the votes. Below, only the top 10 films are reflected from the latest 2012 voting polls, and from each previous decade.